Olympia Umbrella Insurance Agency - All Insurance, Inc. If insurance is for a rainy day, umbrella insurance is for a storm. 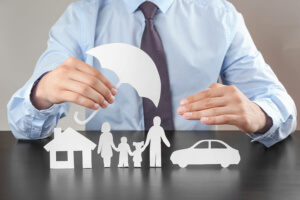 Umbrella insurance protects you during those times when your regular home or auto policy’s liability limits are exhausted, and you are faced with a lawsuit and millions of dollars in liability coverage. Millions of dollars? Is that realistic? Unfortunately, it is. But it is a fact that in today’s world, the newspapers are filled with more and more articles about accidents, lawsuits, and liability questions. We are human, and our mistakes sometimes have severe consequences, consequences that can reach millions of dollars in liability. A million dollars can add up easily – particularly if the injured person suffers injuries that keep him or her from working for weeks, months, or years. The victim of an accident could sue you for medical bills, lost income, even pain and suffering. Not to mention damage to their vehicle, and cost for an attorney. $300,000 bodily injury per accident, and $100,000 property damage. Depending on the extent of the damage and injury, you are responsible for paying the rest – if you are at fault in an accident. And that means you may have to hand over your home, stocks, retirement or college funds, or any other significant assets. It adds $1 million (or more) of liability protection on top of your auto, home, and boat liability coverage. And because it is designed for those really rainy days, umbrella insurance is cheap. You can usually buy umbrella policies with $1 million limits for $130 to $250 a year. If you need more than $1 million limits, you can buy each extra $ 1 million of coverage for $100 to $150. How much insurance is enough? The answer is different for everybody. It depends on what you want to protect, and how much risk you are willing to assume. Your goal with an umbrella policy is to put as much insurance “buffer” as possible between a serious accident and your hard earned savings.